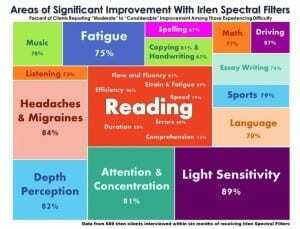 Could Irlen be your answer? Do you cope around any of these issues? Is it hard coping around these issues? Those are just some ways people’s brains work around this glitch, but it can lead to some of the challenges at the top of this page. The people at www.irlen.com have a ton of (free!) information on their website, along with (free!) screening questionnaires. The more questions you answer “yes” to infers that you ought to consider getting screened. IF this is behind your headaches, your dislike of reading, your difficulty making sense and remembering what you’ve read — the correct overlay or combination of overlays can transform your world as much as prescription glasses do for people who need THEM. Just as we would never consider NOT helping those whose visual focus do better with up-to-date glasses, we should definitely consider whether overlays — or Irlen lenses themselves — would help people whose optic nerve doesn’t process all the colors correctly. For more information: www.irlen.com and www.irlen.com/get-tested . Need to be screened? Email or phone Ruth: movementsolutions@outlook.com or (402) 339-0992.